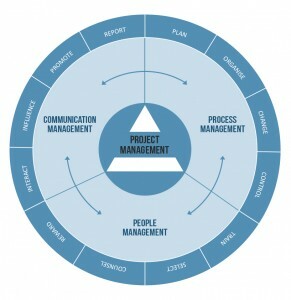 When you take on the role of project manager, you take responsibility for everything to do with your project. It’s a very big job which the diagram to the left gives you some idea of. If anything goes wrong – it’s all your fault! Over the years I have taught and mentored quite a few actual and so called project managers and for some, the penny has dropped that project management isn’t right for them. They don’t want that responsibility. But if you are going to be a good project manager – no, let’s make that an excellent project manager – you need to learn to live with the responsibility. And you do that by putting yourself in the best position possible by learning from your mistakes and those of the people around you. In fact, the smartest project managers learn as much as possible from those around them and avoid unnecessary pain. Constantly assess your own strengths and weaknesses. Don’t rely on your own views though. We rarely have a well balanced view of our own capabilities. Some of us will be over confident or even arrogant. Others will be self-deprecating and overly modest. Base any self-assessment on some key metrics and back it up with real evidence that demonstrates progress against each of the key skills groups. Then validate it with some colleagues, your boss, or better still, a mentor. Get yourself a mentor. There is no better way to accelerate your personal development than with an experienced and knowledgeable mentor. Discussing situations with them will help you identify potential problems and mitigations and their cool head in a crisis good just get you out of the smelly stuff! Become a consummate networker but don’t just gather connections for the sake of it. Target people with specific experiences that you could learn from. If you are facing a particular issue right now, reach out to your network. Be discreet and cognisant of confidentiality issues, especially if your network extends beyond your own organisation. But most people will respond to the proverbial cry for help so leverage their generosity. Be sure to return the favour as that really helps to encourage others to help you. Get yourself on some training. Good training lead by the right trainers can have a double impact. Not only will you learn from the training itself and all the practical experiences of the trainer, but you’ll also learn from the other delegates on the course. Two notes of caution here. Firstly, make sure your trainer is, or was recently, a hands-on project manager. You want to learn good practice backed up by theory, not a regurgitated text book or a method to answer exam questions. Secondly, face to face training is best. However, if you go the online route, chose a provider that gives at least two ways to interact with other delegates such as through regular membership group calls, Facebook groups or LinkedIn groups. Read and contribute to blogs like mine. I blog about many of my own experiences and those of colleagues I have worked with over the years. I use these stories, often in more detail, in my training and mentoring. Not everyone feels confident about blogging and may not have the time, knowledge or inclination to set up a blog. But most project managers are on LinkedIn which offers many opportunities to share your experiences through status updates, Pulse submissions ( a way of publishing an article) and group posts and discussions. It’s so easy to interact so there really is no excuse not to. Keep your own log of experiences. This is a piece of advice I have only started following myself since I started blogging and I use it mainly to collect ideas for future post and training courses. I use Evernote to collect and organise my notes. I’m sure there are dozens if useful snippets and experiences that I could have recorded over the years that have now slipped through my fingers. But not anymore. Make sure you create your own little knowledge base. That’s just what a former colleague did. He tucked away the memory of a nasty little screw up when a system wasn’t able to cope with a leap year. Almost 4 years later, he got his reminder, and promptly got his teams to check all new and updated systems implemented since the last leap year and identified several problems that would have caused further embarrassment to his company. Lesson learned, logged, recalled and re-used. That’s setting yourself up for success. Good project managers plan for everything they do know about. Where there is something they know of, but don’t know all about it (the “know what you don’t know”), hey plan how to resolve the uncertainty, to get the knowledge, and in the worst case, build in contingency to deal with it. For the truly unknown (“don’t know what you don’t know”) they recognise it could exits and add on extra contingency based on their experience. They are as prepared as they can be. So when something unexpected does occur, they accept it’s their fault, take it on the chin and deal with it. It’s all part of that big job! Start the exchange today by sharing some of your experiences in a comment below.